In many instances banks' internal stakeholders will be aware of the existence of operational under-performance, however without any suitable comparison the performance gap is highly challenging to quantify. Further, while there may be an overall perception of the specific areas in need of improvement, banks will often lack the granular details required to initiate a strategy to close the performance gaps. The client, a Tier 1 Investment and Corporate & Transaction bank, engaged with Expand to obtain actionable insight in order to close an operational performance gap compared to peers. 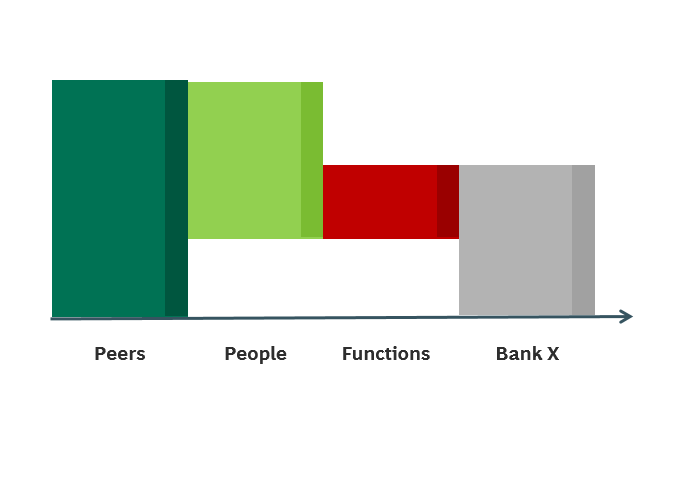 The bank's perception was that it had a fragmented location footprint, and that operational performance was sub-par across a range of functions. However, despite this it was unable to extract any information detailed enough to action any effective cost-saving efforts. Expand performed a benchmark study quantifying functional and locational weaknesses within the group. The exercise gave the client clearer idea of specific areas in need of improvement, and importantly it also emphasized previously unidentified causes of poor performance. The study provided the client with valuable and actionable insights. For example, it revealed that under-performance was a consequence of work performed within another group of the bank, and quantified the number on the unintended costs resulting from poor Front Office decisions. The findings provided the client with a substantial suite of opportunities to increase performance and put downward pressure on costs, and the data generated from the study served as a foundation for a new Front Office/Operations committee.